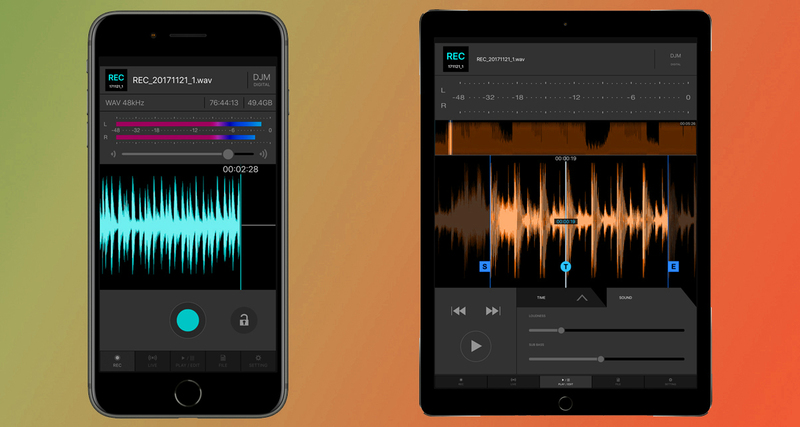 Will Pioneer DJM-REC app change the way DJ’s record, edit and distribute their mixes ? Recording a mix can be a stressful, having to carry a recorder, a pair of cables, extra batteries and then transferring it back on to your computer to fix levels and edit. Trust Pioneer to come in to aid you in the world of dark clubs, cumbersome cable cabling and usual DJ anxiety. Recording a set is sometimes even harder than playing one for some of them. Pioneer announced their new DJM-REC iOS app today that enables you to record your mixes directly on to your mobile device in high quality stereo WAV files via the digital send return port found on the DJM-TOUR1, DJM-900NXS2, DJM-750MK2 and DJM-450 mixers. With a quick firmware update on your mixer to support on device recording, you can even stream your mixes to social media via the app, whilst also giving you basic editing tools, an auto-limiter, peak volume based auto-recording, editable track-stamping and even a sub-bass enhancer. This will radically change the way DJs record, share and distribute DJ sets. I for one always advocate DJs record as often as possible, it serves as a great way to track your musical evolution. Prior to this, the only way to record to a mobile device was through a TRRS cable, and only mono. Since Pioneer has a selectable switch for send/return to toggle between analog and usb, this makes it impossible to record while using any external FX via the analog send returns or forego using external FX in lieu of recording on the app. Also, needless to say if you’re recoding on your device, you’ll have to get on Airplane Mode. Capture it on the iPhone/iPad with an external microphone when your device isn’t connected to a DJM mixer. While iOS uses rejoice, this may be a disappointment for most android users. However there are a few work arounds to record your set without investing in an expensive portable recorder. For example, you could use the additional output (channel 9/10) on the DJM900NXS2 through it’s utility to route the record output to that digital channel and have your favourite audio software capture it. Having said that, this is certainly a boon for most DJs and I see myself using this extensively. The price point is fair at $9.99 with a 30-day trial. For the serious audiophiles looking for a mobile based solution, Evermix Mixbox 2 is a nifty interface that connects to your mixer’s analog record out and then into your iOS device.